If you’ve been looking for ways to take your photography to the next level, chances are you’re already considering a digital single-lens reflex (DSLR) camera. In recent years, the cost of entry-level DSLRs has gone down considerably, making them an affordable alternative to compact digital cameras. At this point, anyone who wants to get the most bang for their buck should be making the switch to a DSLR to enjoy benefits that render most other camera types obsolete. The top of the line Nikon D5 isn’t cheap, but if you’re looking for the best of the best it certainly deserves consideration. With a 20.8 MP FX-Format CMOS Sensor and continuous shooting with full AE and AF performance at the rate of 12 frames per second, Nikon’s flagship full-frame model can snap up to 200 shots within a single burst. It also includes professional video features and the ability to record in 4K Ultra High Definition. The newly redesigned AF technology features 99-cross-type sensors, 153 individual focus points, and a dedicated processor. To top it all off, it has a wider native ISO range than any other full-frame, which can be expanded beyond its default max of ISO 102,400 all the way up to ISO 3,280,000. Click here to see its price. If you can’t afford the flagship D5, Nikon’s D500 provides a more affordable alternative with many of the same features. Most of the important perks are retained in this slimmed down version, however it uses a 20.9-megapixel APS-C instead of the full-frame CMOS used by it’s more powerful sibling. Still, it can record video in 4K and it uses the same 153-point AF/99 cross-type autofocus system, which is known to be the best on the market. If a full-frame sensor isn’t a necessity for you, the D500 offers a well-rounded package that’s great for wildlife and action photography. You can buy it here. The Canon EOS 5DS is known for having the highest resolution of any full-frame DSLR, with approximately 50.6 megapixels and a maximum continuous shooting speed of 5 frames per second. Intended for expert users, this beast of a camera is equipped with a full-frame CMOS sensor, a 3.2-inch viewing screen, and excellent dynamic range. Many pros consider this model to be a breakthrough in DSLR technology because it manages to pack an absurd amount of pixels into the sensor without compromising quality thanks to its unmatched resolving power and anti-aliasing cancellation filter. It couldn’t take the top spot because it’s not capable of recording in 4K, it generates very large files and requires the best lenses money can buy to achieve its full potential. Still, if you get past these minor caveats, it’s by far the best alternative to Nikon’s D5 in terms of picture quality. Find more information here. The Nikon 3400 is widely known as a perfect beginner’s DSLR thanks to its lightweight, compact design and self-explanatory controls. Despite being small and handy, it is equipped with one of the best sensors in its class, boasting an impressive 24.2-megapixels and 1090/60p HD recording capabilities. There’s also a built-in WU-1a wireless adapter that lets you easily send content to your smartphone. Quick and easy editing features, simplified file sharing, and 5 fps continuous shooting speed make this an optimal choice for anyone looking for a beginner-friendly DSLR. This link has additional information. The main strength of the EOS Rebel SL1 for beginners is that it comes with a large touch screen that features easy-to-use controls. Although the sensor is slightly smaller than the Nikon D3400 it carries a similar design in terms of being easy to handle thanks to its compact, lightweight frame. It could easily tie for the best beginner’s DSLR if it weren’t for shooting fewer megapixels at only 18MP and shooting at only 4 fps instead of 5. However, the quality difference in the exported files isn’t noticeable under most conditions. Due to Canon’s proprietary Scene Intelligent Auto technology, it gives any camera a run for its money in the simplicity department by automatically adjusting settings to achieve optimal results. Go here to buy it HERE. Coming in as the first brand other than Nikon and Canon on the list, the lesser known Pentax K-50 has been making waves as a strong competitor to the two aforementioned cameras. It has the lowest megapixel count in this category, but negligibly so at 16.3 MP. Nonetheless, it makes up for this slightly by having the highest frame rate at 6 fps, which makes it slightly better for wildlife, sports, and other action photography. The 3-inch touchscreen, 30 fps recording rate at 1080p, PRIME M image processing engine, and built-in shake reduction system are other nice features that make it ideal for a beginner. Find out more here. Although technically the EOS 5D Mark IV has a lower resolution than the incredible 50-megapixel 5DS since we already listed that one as one of the “best overall DSLRs,” this one easily takes the runner-up position. With a 30.4-megapixel full-frame CMOS sensor, a 61-point AF/41-cross type Autofocus system, and a 3.2-inch touchscreen, this camera is easily Canon’s best DSLR next to the aforementioned 5DS. However, being that it’s about half the price of Canon’s actual flagship, many would consider it to be better for the average photographer who doesn’t have an unlimited budget. See the best price here. In addition to having a 20.2-megapixel APS-C CMS image sensor, the EOS 7D Mark II also has an exceptionally high frame rate, with 10fps continuous shooting and a pro-grade 65-point AF, 65 cross-type autofocus system, this camera offers excellent action photography. It’s also highly durable with weather-sealed controls and an alloy body. Overall, the EOS 7D Mark II is highly versatile and is known for being one of the best deals in the Canon line. Find out more at this link. With a high frame rate of 14 fps, a large 3.2-inch LCD display, and a highly flexible Autofocus system that includes 41 customizable AF points – 61 total, the Canon EOS1D Mark II deserves mention as one of the brand’s top three cameras next to its flagship EOS 5DS. Although the CMOS sensor can only capture 20.2 megapixels, it’s equipped with hardware that gives it all the bare necessities a DSLR needs in the best way possible. The resulting images are always impressive and this camera does a great job of reducing noise even in the worst conditions. Buy one here. If you’re looking for the absolute best Nikon camera, that would be their flagship D5 listed in the “best overall DSLR” section above. However, coming in 2nd behind that would have to be the D850, with a desirable 36.3-megapixel HDSLR sensor and the powerful EXPEED 4 image processor. This is a professional grade camera that is known for remarkable detail retention and a wide native ISO range of 64-12,800. The D850 follows in the tradition of excellent cameras — the previous version D810 won the Imaging Resource “Camera of the Year” award in 2014. Another interesting thing to note is that Nikon makes a version called the D810a, which is the first DSLR designed specifically for deep-sky astrophotography. This link has more information. With a full-frame 24.3MP DX-format CMOS sensor, EXPEED 4 image processor, and a special Vari-angle tilting LCD screen, the D750 offers most of the same features as the D810 but with a slightly smaller sensor. Built-in WiFi, 1080p video recording, and a 6.5fps frame rate make this a well-balanced choice for enthusiasts looking for flagship-level performance in a more affordable package. The D750 won Imaging Resource’s “Camera of Distinction in 2014” for basically being the next best thing to the D810. Go here if interested. The D7200 comes in as close behind the D750, with a 24.2-megapixel DX-format CMOS sensor and the same EXPEED 4 image processor. Surprisingly, it has a wider native ISO range, expanding all the way up to 25,600 while also having an Auto ISO mode for easy operation. This one is categorized in Nikon’s line of “enthusiast” DSLRs, which sits just below what you would expect from a professional level camera. This was also the brand’s first DSLR to feature built-in Near Field Communication (NFC) and WiFi connectivity. The time-lapse feature, 1080p recording, and a frame rate of 6 fps make this an ideal choice for someone who wants the best equipment for their hobby but isn’t ready to commit to a larger pro-level purchase. To see its price, click here. At 1.22 pounds it isn’t the lightest model available, but the Nikon D5200’s frame is very small and the bit of extra weight is actually due to it being constructed with durable materials. The slight heftiness makes it sit steady during the shot as well, so some find it to be the best of both worlds – sturdiness, and ease of handling. The 39-point Autofocus system, 5 fps continuous shooting frame rate, and 1080p 30 fps recording capabilities give you a lot of bang for your buck within this small yet flexible package from Nikon. See its price at this link. The Pentax K-70 is not only super compact and well-designed for ergonomics and handling, it’s also completely weather-sealed and dustproof. The Vari-angle LCD display makes it easy to capture content at tough angles. You could easily mistake the K-70 for compact digital given its size alone. It’s a bit heavier than the other two compacts listed above at 2 pounds. If you’re looking for a durable, weather-resistant, and easy to clean model in a frame that can comfortably fit in your grip, the K-70 is a great option. Interested? Click here. This is the entry level selection of Canon’s Rebel line and at under $1000 it’s a commendable value with a 24.2-megapixel CMOS sensor and a 19-point Autofocus system. A frame rate of 5 fps for continuous shooting makes it a doable choice for action photography and the ability to record in 1080p is an added perk. With no 4K recording, and a native ISO range of 12,800 (expandable to 25,600), this one isn’t the most robust DSLR but it hits the spot for any enthusiast searching for an entry-level option. It can be bought on Amazon. The Canon Rebel SL2 is one of the best in terms of cost-effectiveness, but the downside is that it doesn’t have the best Autofocus system with only 9 AF points and a single center autofocus point. The 18-megapixel ASP-C CMOS sensor lets you know this is still a bonafide DSLR despite its low cost. The 3-inch touch panel LCD is what you’d expect for a camera of its size, and the 1080 HD video recording gives it the minimum resolution need to suffice this section of the market. Find out more. Sitting just under $500 is Nikon’s D3400 with a 24.2-megapixel DX-format CMOS sensor, EXPEED 4 image processor, and an impressive native ISO range of 100-25,600. This is also an ideal choice for the enthusiast, hobbyist, or home photographer because it can automatically share with up to five smart devices. It comes with a DX NIKKOR 18-55mm kit lens that utilizes a stepping motor to ensure super quiet autofocusing that doesn’t disturb audio being captured by the built-in mic. See more about it by clicking here. Although the Rebel T6 bundle will cost a little bit more than $500, the camera alone fits narrowly into this price range since the IS II kit can be found for around $400. When you consider how much value you’re getting in such a bundle, with 18-55 mm lenses and a number of other important accessories, this is a model that could easily have fit into the best entry-level DSLR category as well. Get other’s opinions here. Ultimately, there is no DSLR camera that is a one-size-fits-all, so the decision should be based on which features you’re most interested in and/or the limits of your budget. Some people may find price and ease of use to be the most important factor, while others are after the most advanced model within their budget. With the categorized lists and tips above we’ve given you all the info and model names needed to make a choice, you won’t regret. Regardless of what you’re after, you now have a strong foundation from which to start your search. Superior Speed and Responsiveness – If you’ve been using a digital compact camera then you know just how frustrating it can be to deal with the delays that often cause you to “miss the shot.” Most digital compacts will take a few seconds to snap the picture because they take about 1 second to start up, a second to lock focus after the shutter release button is pressed, and another second to take the shot once focus is locked. Better Picture Quality – DSLRs can use a variety of lenses that consistently outperform those used in digital compacts. They also use much larger sensors – about ten times larger in many cases. These two factors allow them to produce better images even when capturing fewer megapixels. As a result, it’s common for a 10-megapixel DSLR to outdo a 14-megapixel digital compact in many scenarios. The difference between the two is profound but is easiest to notice in low light conditions. In basic terms, DSLRs contain image sensors that are much more sensitive to light, allowing them to pick up more details in noisy/dark environments. Furthermore, they feature a larger number of ISO settings that can be used to customize how much light is captured by the sensor based on the conditions of the scene you’re photographing. Better Recording Quality – Since DSLRs have larger imaging sensors and better lenses, they’re able to record better video content than compact cameras. In fact, in terms of quality they can now compete with many of today’s HD camcorders with only a few exceptions. Most camcorders can record up to 2 hours of content at a time, whereas DSLRs typically have a 30-minute recording limit. However, digital compacts also have the same time limitation. Camcorders also usually offer better manual zoom control as well as better audio recording control, so there’s no denying that they’re optimal for recording long stretches of video, but DSLRs manage to strike a balance between taking pictures and recording video while maintaining quality on both ends. Interchangeable Lenses – Although digital compacts typically include a single lens, DSLRs offer complete versatility because they’re compatible with a wide range of lenses. Ultimately, this makes them capable of covering much broader focal lengths, so you can fit more content into the shot or focus in on a small aspect of a scene more accurately. Complete Control Over Settings – One of the main perks of digital compacts is the automated controls. There’s no need to select specific settings before taking a photo because the hardware assesses the scene and does that for you. However, this lack of control can be a bad thing when you’re trying to achieve certain results. Using Filters in Real-Time – DLSRs are also some of the only cameras that can use filters to change the appearance of a scene as it appears before the shot. In the tips section below we list the essential filters every photographer should have in their arsenal. Unlimited Creative Freedom – Perhaps the biggest advantage DSLRs offer is the scope of creativity they can facilitate. Many pros rely on them as go-to gear because they can accommodate every shot regardless of the conditions. Since this component plays the essential role of capturing light which then becomes your image, perhaps the most important feature in any DSLR camera is its sensor. There are two main types of sensors used in DSLR cameras: Complementary metal-oxide-semiconductor (CMOS) and a charged-coupled device (CCD). Of the two, CMOS sensors are more common and are themselves good enough to get the job done for most photographers. However, CCD sensors are known to produce higher quality images, but they also require more power and they’re more expensive than CMOS sensors. Sensor size is also a key consideration, even though the megapixel count isn’t necessarily the most important feature on the camera. A larger sensor means the camera can capture more detail within a single shot. Many DSLRs have full-frame sensors (35mm equivalent) which are currently the industry standard, but there are some medium format cameras that have “larger-than-full-frame” sensors. The number of frames that can be captured within a second is called the frame rate. A camera with a frame rate of 10 frames per second (fps) will capture more frames within a second than a camera that captures 5 fps. Cameras with higher frame rates (5-15 fps) are known to be better for action, wildlife, and sports photography. A lower frame rate means you’re more likely to encounter blur and/or miss the shot when the subject is moving quickly. Most DSLR bundles will include a lens kit, with lenses ranging from 18mm to 55mm. In addition to the kit that comes with your camera, it’s a good idea to learn about the various available lenses and how they can be used to improve your photography. You’ll want to expand your collection with ultra-wide angle zoom, telephoto zoom, and macro lenses just to name a few. As you may already know, a megapixel is 1 million pixels, so a camera with a 20-megapixel sensor is capable of capturing 20 million pixels. In most cases, having more megapixels is an advantage. However, if you’re shooting with a lens or camera that outputs to a smaller format or has a smaller sensor, too many megapixels can make the image look grainy because of an excessive amount of megapixels being crammed into a small space. In general, if a camera has more than 15-20 megapixels, that should be sufficient to create stunning HD imagery. Cameras that can capture up to 40-50 megapixels or more are mostly ideal for creating medium to large format photos. The image processor handles the crucial task of processing the data captured by your camera’s sensor. A faster processor will allow you to take more pictures within a set amount of time. A powerful processor ensures responsiveness and speed, both of which are incredibly important attributes then you’re trying to capture a very specific moment. Each brand has its own proprietary image processor, so it’s difficult to compare them with each other, but your best bet is to at least aim for a recent generation. For example, Canon’s EXPEED processor is available in their D5 camera as EXPEED 5 and in the D810 as EXPEED 4. Those would be ideal choices compared to an older model that is equipped with EXPEED 3. The Autofocus (AF) system gives you on-screen focus points that you can move around to select areas of the viewfinder that will carry the highest focus priority. The more Autofocus points an AF system has, the more likely it is that you’ll be able to capture your subject in focus even if they’re moving around a lot. Even though a 9-point AF system is good enough to perform basic action photography if you want the best of the best you’ll want to look for a camera that has an AF system with 30 or more points. Also, pay attention to the number of cross-type sensors an AF system has – more is better. Ideally, you’ll want to choose a camera that can easily interface with your smartphone via Wi-Fi or Near Field Communication (NFC). Unfortunately, some models are a bit behind in the connectivity department, but there are plenty of affordable options that include this basic feature. You also have the option of equipping a camera with a Wi-Fi-enabled SD card if it doesn’t have a built-in WiFi adapter. One way to save money and build up your gear gradually is to go for the “body only” camera deals and then later purchase lens kits and other upgrades. You’ll notice it’s possible to get the body of the camera by itself for a couple thousand cheaper than it would be to buy an entire kit outright. This is typically the best option if you already have an extensive kit that will be compatible with your new camera or if you just want to get the ball rolling on a budget. Take a Photography Class – Perhaps the fastest way to become familiar with the tricks of the trade is to simply enroll in a photography class or take one or more online courses. Of course, general photography knowledge will be useful to you no matter which model you select, but to go beyond that you’ll need to heed the other tips below as well. Understand Lenses and Filters – Once you’ve got a firm grasp on basic photography principles and tips, it’s time to learn about the best filters and lenses for DSLRs. Unless it’s a body only model it should come with at least one “kit lens.” Be sure to look beyond the kit lenses and into other types like macros, wide angles, prime lenses, and telephoto zoom lenses. Every good photographer knows that you can wind up spending the same amount if not more on your lenses and filters than on the actual body of the camera itself. If you want to get the best shot every time under any circumstances, becoming familiar with an arsenal of lenses and filters is imperative. Practice Routine Cleaning – Moisture, oils, dirt, and other miscellaneous filth can accumulate on the surface of your lenses and other parts of the camera. This can become a problem for sports, wildlife, and nature photographers who frequently expose their cameras to the elements. There’s nothing more frustrating than pulling out your camera to catch a great shot only to be let down because your equipment needs to be cleaned before it can perform. You stare into the viewfinder and recognize the dreaded glare or smear that completely ruins your hops of a decent photo. Avoid this common problem by practicing routine cleaning and proper storage. Control the Aperture – A great way to put the focus on a specific object or spot in a scene is to use the aperture control settings in your DSLR to adjust the size of the opening that allows light to reach the sensor. Doing this lets you change the depth of field (DOF) from shallow to deep. A shallow DOF will give you a smaller range of focus while a deeper DOF gives you a wider focus area. The final result of the aperture adjustment will depend on focal length setting, sensor size, and how far you are from the intended subject. Research and practice aperture adjustments to hone the skill of placing focus on specific areas and you’ll be able to give your photos a more realistic and 3-dimensional look. Making your subject the primary focal point lets you devote the camera’s full resolving power to the area that you want to highlight the most. Use Shutter Priority Mode – Any action, sports, or wildlife photographer should learn how to use shutter priority mode to achieve different effects when photographing fast-moving objects. A fast shutter speed – like 1/2000 – lets you capture action-packed scenes without any blur, while a slower shutter speed – like 1/125 – gives you a relatively clear shot but with a slight touch of motion blur. Keep in mind the shutter speed will also affect your DOF, as the camera will automatically calculate aperture based on the shutter speed you’ve selected. Although slower shutter speeds do create some motion blur, some photographers prefer this in certain shots because it helps illustrate how fast the object is moving while also creating a deeper DOF. Save Presets and Priority Settings – If you’re regularly photographing similar scenes or environments, chances are you could save yourself a lot of time and expand your creative capabilities by saving priority settings as programmed presets. Then, if you find a particular exposure or aperture setting that has worked well for you, you can easily save it and try using it, or an adjusted version of it, later on. Take Advantage of HDR – If you’re trying to create stark and stunning contrast, utilizing the High Dynamic Range (HDR) feature in your DSLR camera should be the first lesson on your list. This setting actually causes the camera to take several separate photos with different light settings for each. The separate shots are then automatically layered and saved as a single image. Using HDR is particularly helpful when photographing large landscapes, portraits in sunny conditions, or in places where the background or main focus area needs to be brightened without washing out contrast. However, HDR may not be ideal for photos that contain movement, scenes that are already very high in contrast, and scenes that contain a lot of vibrant colors. Record a Video and Use the Stills – Sometimes the best route to take when you want to capture more than just a moment is to use the record function. Almost all DSLRs can record in 1080p Full HD and some can even record in 4K Ultra High Definition (UHD) resolution. Thus, you have the option of recording not only to produce videos but also to have a full archive of footage from which you can pause and select frames/snapshots to be exported as photographs. Use Continuous Focus for Action Scenes – If you’re struggling to get a clear picture of a fast-moving object in an action scene even though your DSLR camera has a decent frame rate, you might be neglecting the highly important continuous focus feature. In this mode, you start by framing your subject within the on-screen focus box and then half-pressing the shutter button, at which point the camera begins tracking the subject’s movement and automatically adjusts focus accordingly. This is useful when your subject is moving rapidly away from or towards the camera, or when they’re frequently jumping out of your AF points. 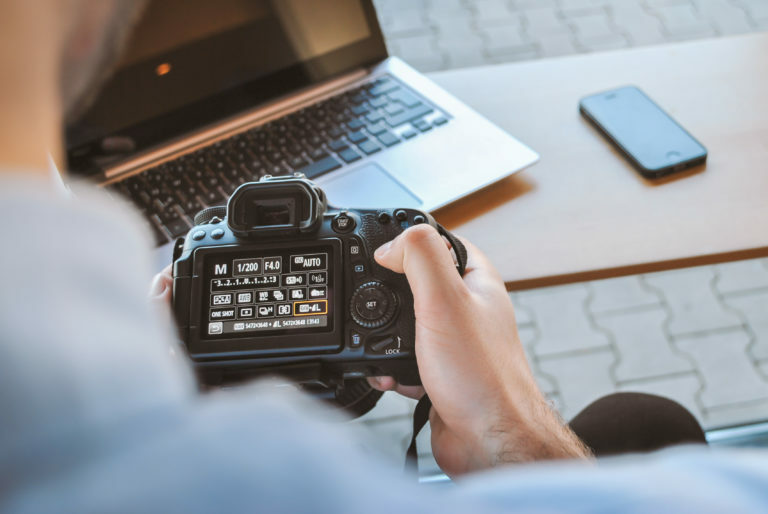 Save and Share Files in RAW Format – Most DSLRs are set to save and export images in JPEG format even though they’re capable of saving in RAW format. When you’re saving photos as .jpeg format you’re losing some resolution to the compression that takes place. Shooting in RAW mode ensures you’re exporting the original image of the highest quality. Surprise subjects by shooting in quiet mode – capture the moment without disrupting it. Experiment with built-in effects and filters – get to know what your hardware can do. Use the histogram to find the perfect exposure for follow-up shots. Upgrade to a larger memory card. Try shooting in full manual when you’re confident you don’t need the camera’s AI. Don’t Forget to Read the Manual! We know it can be difficult to read through every page in the lengthy manual of a DSLR camera, but if you want to really master your craft and use the device to its full potential, reading the instructions is a mandatory step.